Hi all. This is my first year as an official teen librarian, and I'm loving it so far. But sometimes I feel this pressure, whether real or imagined, to keep up with all the teen books that are popular and relevant. I would say I've got a pretty vast knowledge of teen books out there, but I by no means have read them all. It would be almost impossible to do so and still have a life. That said, this year I've decided to take on The Hub Reading Challenge 2013. For those of you who aren't familiar with The Hub, it's the official blog of the Young Adult Library Services Association (YALSA), the YA division of the American Library Association. (You know, we have those conferences and stuff.) The basics of the challenge are this: Read 25 books out of the 84 books that won a Youth Media Award this year. The list of eligible titles are on the blog post I linked to above, if you are interested in joining or are curious to see what books made it onto the lists/won awards. 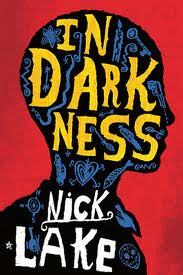 In Darkness by Nick Lake, winner of the 2013 Michael L. Printz Award. This was an excellent and dark novel focusing on Shorty, a teenage gangster in Haiti buried under the rubble after the 2010 earthquake, and Toussaint L'Ouvreture, the man that led Haiti's slave revolt in the 1800s. Both stories are told in tandem, and are connected in surprising ways. What really made this book for me, though, were the characters. They might be killers and drug dealers, but they have loving and generous sides to them that are not apparent at first. I highly recommend this to anyone up for the challenging material. 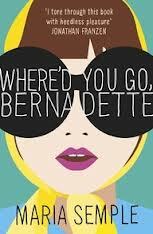 Where'd You Go, Bernadette by Maria Semple, winner of a 2013 Alex Award. 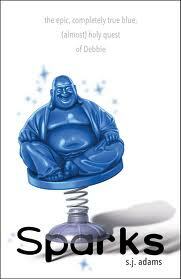 The Alex Awards are given to books published for an adult audience that have teen appeal. I really had a lot of fun reading this one, since it's mostly told in e-mails, letters, notes, and official reports, along with the occasional narration of 15-year-old Bee, daughter of the title character. The premise is Bernadette Fox, a recluse in Seattle, goes missing, and Bee decides she's going to try to find her. It's really funny, and I never knew exactly where it was going, which made it all the better. Sparks: The Epic, Completely True Blue, (Almost) Holy Quest of Debbie by S.J. Adams, winner of a 2013 Stonewall Honor. An irreverent and hilarious adventure in the wilds of Des Moines, Iowa, centering on Debbie's realization that needs to tell her super-Christian best friend Lisa that she's in love with her. In desperation, Debbie decides to listen when classmate Emma tells her about the Church of Blue, a made-up religion she and her friend Tim have created. So they give a holy quest for Debbie: Find Lisa and tell her how she feels, before her douchy boyfriend Norman does. Personally, I wish all the Christians portrayed in this novel weren't such jerks (and in fact would act like Christians), but I can see why it was necessary for the story Adams tells. In any case, I don't really think there's much to be insulted by here, and it was fun. 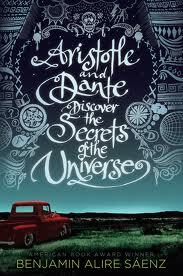 Right now I'm working on Aristotle and Dante Discover the Secrets of the Universe by Benjamin Alire Saenz, which won both the Stonewall Award and a Printz Honor this year. So far I like it very much, and again, what's winning me over are the characters, particularly Ari and his father. I'm guessing I'll finish it in the next day or so, since it's a really quick read despite its length (short chapters can be a blessing). EDIT: I just finished Aristotle and Dante about 10 minutes ago and PLEASE go read it. It takes a lot for me to feel such a feeling of triumph and happiness at the end of a book, but this one did it. So far I'm thinking this year's Printz committee did a damn good job. Have you read any of the award winners from this year? What challenges are you taking on right now? This sounds like an exciting challenge! I definitely need to check out some of these titles! I just added "Aristotle and Dante"! Aristotle and Dante sounds like a really interesting book. I'm going to have to check it out. Aristotle and Dante? Must get that for my boyfriend immediately as those are his two favorite people ever. In other news, your blog is awesome. I have therefore seen fit to share its awesomeness with the world by nominating you for the Very Inspiring Blog Award. The following link will explain the details. The only book out of that list I have read is Inheritance by Christopher Paolini. But a lot of other ones have interesting titles (Putting Makeup on the Fat Boy?!) and your review of the books you've read so far definitely make me want to go and grab some of these books. Eek! Where'd You Go Bernadette is on my coffee table next in line for a read! Glad to see you liked it. "a feeling of triumph and happiness at the end" - I felt exactly the same way about the end! So.damn.perfect. *sigh* ♡ed Aristotle and Dante (and their parents) so much! Arisotle and Dante gave me ALL the feels. Aristole and Dante gave me ALL the feels.